Description: Tree Tots to the rescue! 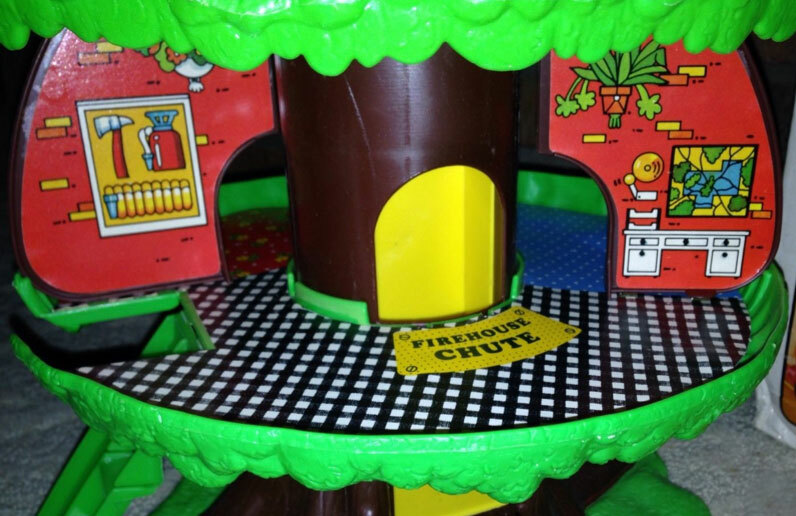 This fully furnished firehouse tree features a leaf "dome" top that lifts up to reveal the firehouse interior. 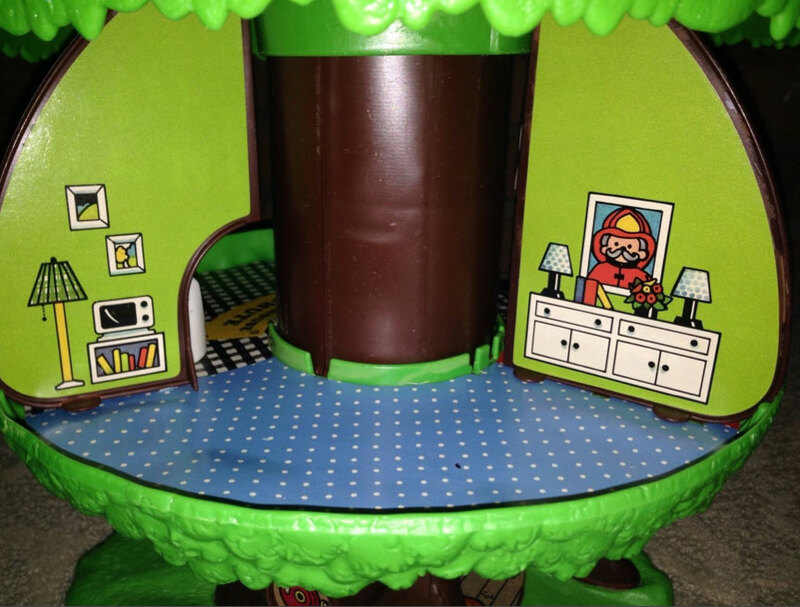 The interior has realistically decorated walls and floors, includes 7 pieces of furniture, a fire truck, fire hydrant, catch net, and 3 Tree Tots. 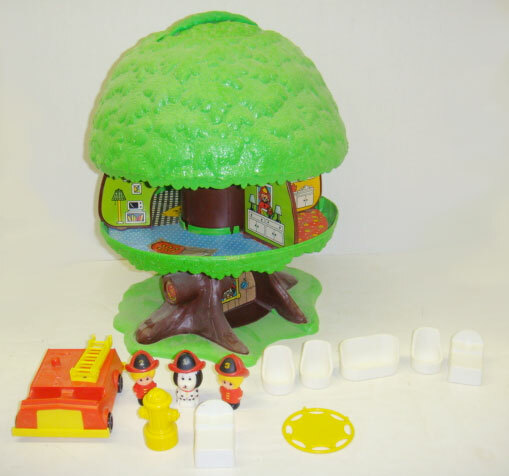 KTT18 - Firehouse Tree - Plastic "tree" with a brown trunk and green dome-shaped leaf top. Features a carry handle on top for portability and a button under the handle to lift the leaf dome to access the firehouse interior. The interior features 3 rooms: firehouse office, bedroom, and a kitchen, each with decorative lithographs on the walls and floor. 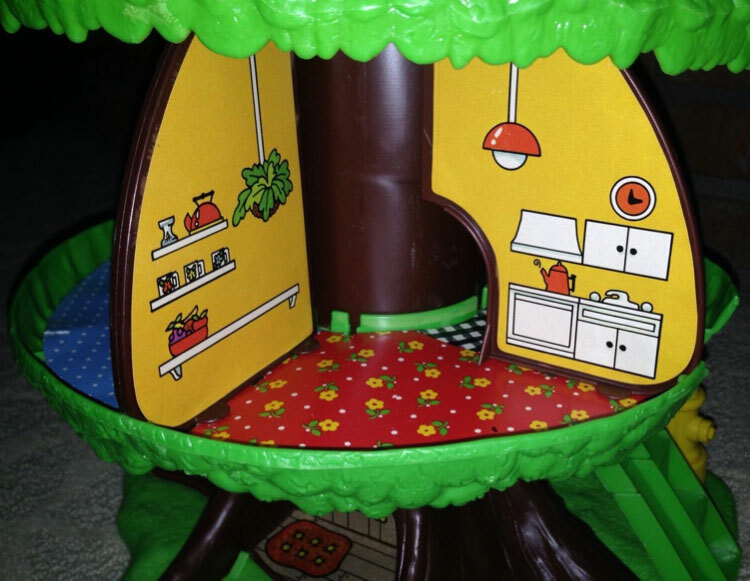 The tree trunk has a firehouse chute inside (curved at bottom of chute like a slide). 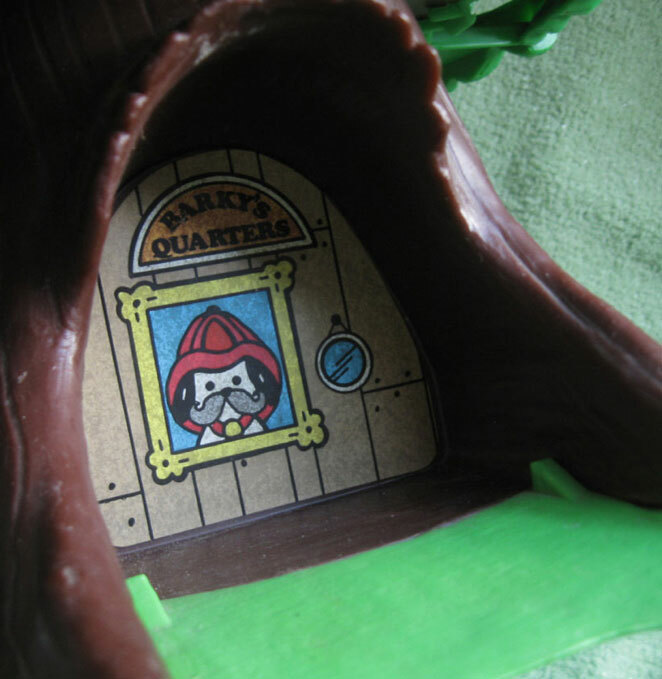 The firehouse office includes a fold-down staircase/sliding board (often broke or missing). 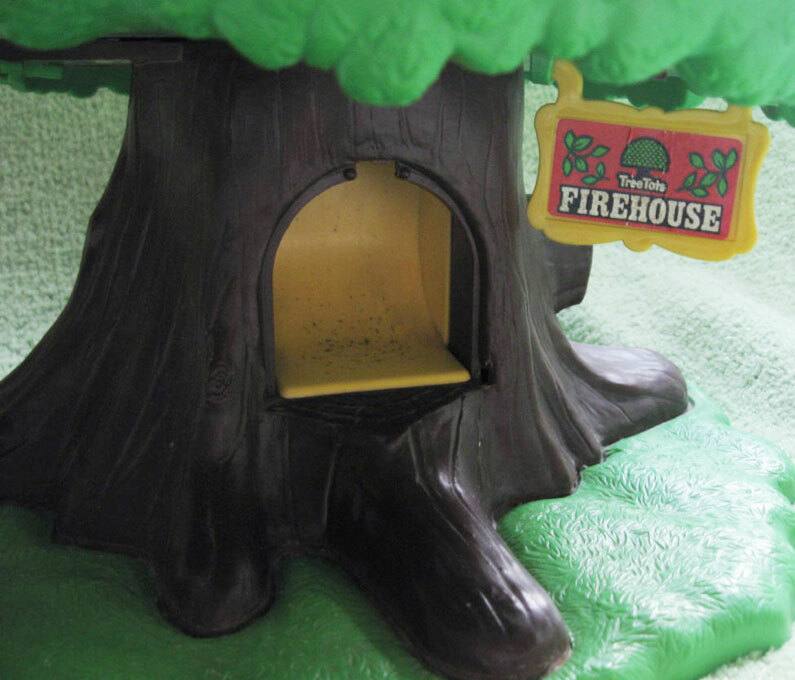 The tree trunk rests on a flat green base with an area to attach the fire hydrant and firehouse sign. 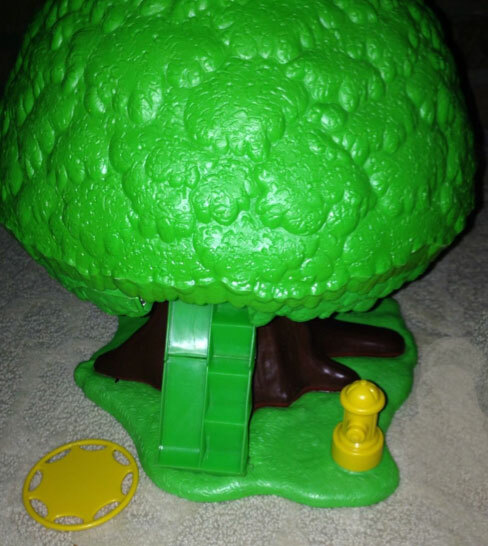 KTT19 - Round yellow fire hydrant (hydrant fits over knob on Firehouse Tree base). 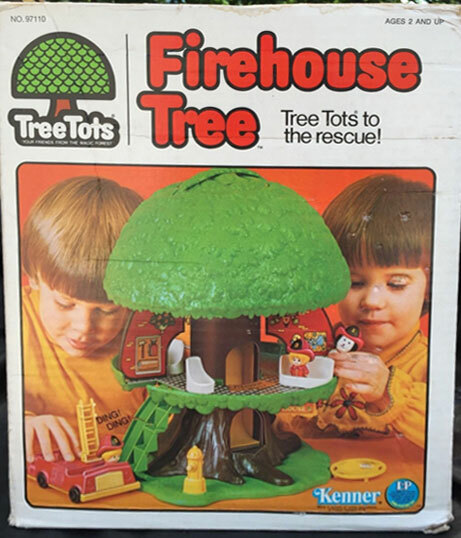 KTT20 - Rectangular sign with a red litho marked, "Tree Tots Firehouse". Sign attaches to loops under the Firehouse Tree leaves (beside the firehouse chute). KTT21 - Round yellow disc-shaped catch net with 8 "handle holes" around the outer edge. 2 each - KTT6 - Bed - Small white rectangular bed with a rounded headboard and an indent in the pillow area (to prevent figure from rolling off the bed). 4 each - KTT7 - Chair - Round white single-seat chair with a high backrest. 1 each - KTT9 - Couch - Rounded white two-seat couch with a high backrest. KTT22 - Fire Truck - Red top, yellow base 2-seat fire truck with a yellow extension ladder on the back and small black wheels. KTT23 - Boy - Ashley Tree Tot - Boy with yellow hair wearing black shoes, a red fire jacket, and red fire hat marked "2". KTT24 - Girl - Ember Tree Tot - Girl with yellow hair wearing black shoes, a red fire jacket, and red fire hat marked "3". 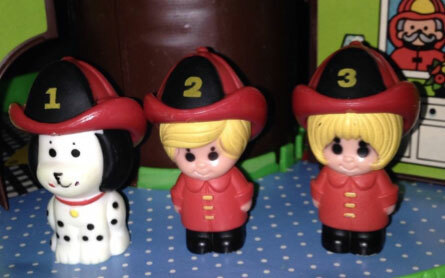 KTT25 - Dog - Barky Tree Tot - White dog with black ears, black spots, a red collar, and a red fire hat marked "1".